to join a regular group, or email me if you don’t want to share. I can do groups up to 25 people, but for groups of under 12 this is more expensive. Book early! Visits last 90 minutes, and take place between 09:30h and 13:00h. Only royalty get to visit at night. The observatory is at 2400 m (7,900 ft) and there is about 25% less oxygen than at sea-level. This is fine for most people until they try to climb stairs quickly, but you probably shouldn’t come if you have anaemia or a serious lung or heart problem, and think carefully about bringing babies or the very old. If in doubt, talk to a doctor. Please consult http://www.iac.es/adjuntos/orm/recommendations-visitors.pdf And bring your own sun cream, water, and food (especially if you’re diabetic). If you want to enjoy La Palma’s spectacular night skies, there are several firms which offer stargazing excursions or telescope rentals. Here is the link to the IAC web page to book a visit. I was at the talk you gave to Loughton Astro at the end of October. 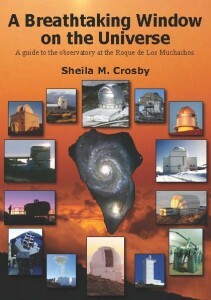 I would like to visit the observatory, is the tour in English ? Usually in English and Spanish. Hope to see you there. We would like to visit the Observatories between Feb 14 – 21 2017. Please let me know how to book. I will let you know which hotel we are staying at so you can advise on transport to the Observatories. It usually boils down to either a hire car or a taxi, although some hotels do organise coach trips. We won’t be hiring a car here is the hotel address please advise on how to get to the Observatories. When is the earliest I can book the obo visit ? Are the observatories open at night for public viewing ? Absolutely not! Where you have people you have lights, and the Herschel could see a candle on the moon. By the way, booking for visits in February is now open. We have booked the observatory visit for Fri 17 Feb.
Hi. I won’t be the guide for the 17th, but I hope you have a great visit. Gregorios taxi service is fully booked for 17 Feb do you know of another. If not can we chane the booking date ? I have found another taxi service – Phew ! Oh good. I hadn’t had time to look. The visit was EXCELLENT we saw the 10.4 m telescope, the giude Antonio explained everything well in English and Spanish.